TAD Disability Services (TAD) is the only charity in NSW which designs and builds custom equipment for people with disabilities. TAD will now be utilising 3D printing technology to produce highly personalised, complex custom equipment to enable people with disabilities to lead more independent lives. TAD’s core workforce comprises skilled volunteers who work closely with TAD’s therapy team to develop these custom pieces of equipment. Items range from attachments to wheelchairs and special seating, to modified bicycles for children who cannot walk and one handed guitars. Many of these projects involve prototypes which are often hand-made from wood and plastics. The Ian Potter Foundation has generously provided a grant to enable TAD to establish a 3D printing facility for rapid, low cost custom fabrication of assistive technology for people with disabilities. This technology makes highly complex custom equipment more accessible and affordable. It takes advantage of TAD&apos;s existing 3D modelling and drafting capability, harnessing the almost limitless design possibilities that can be conceived in software. It enables TAD volunteers to turn designs into solid, functional components that form part of sophisticated solutions that directly benefit people with disabilities. The project includes education and training for TAD&apos;s retiree engineer volunteers, and the appointment of a Project Officer and 3D modeller. Today the printer arrived and produced the first test piece – a small Batman. Andrew Steed has been working with our Rehabilitation Engineer, Nick Asha, to introduce this innovative technology to TAD. Andrew is an honours student in Product Design Engineering at Swinburne University of Technology in Melbourne and brings his knowledge and skill to start this very exciting project. “3D printing or ‘additive manufacturing’ is an amazing emerging technology. 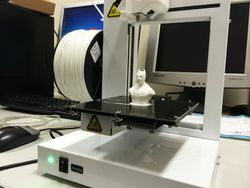 It creates real 3D models from computer files by melting plastic into a thin filament, it then builds them up layer by layer to produce the final product. 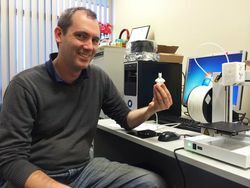 The rapidly decreasing price of 3D printing technology gives TAD an opportunity to help people where it was previously impractical,” says Andrew. “TAD volunteers have used their skills to produce innovative equipment for nearly 40 years. This new technology project will enable TAD volunteers to create designs that might not be practical to achieve with conventional techniques. 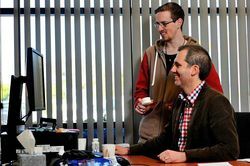 It offers a low cost way to quickly evaluate and refine ideas before delivering to our clients,“ says Nick. 3D printing is already changing production processes around the world. The potential for this technology to transform the lives of people with disabilities is limitless and exciting. Click here for more photos of Batman being made.